I knew this from a very young age. I also knew I wasn’t different in the way other kids thought I was. If I’m being honest, I felt closer to animals than the people around me, and maybe that’s something they picked up on. I didn’t have many friends, although it wasn’t for lack of trying. It’s just I wasn’t interested in their games. Pretending to save the world from make-believe villains seemed silly to me when there were true villains all around us, and so many who needed saving. Why pretend when we could take action? In turn, they weren’t interested in helping me carry a bird with a broken wing to safety or studying the caterpillar and guessing what colors it would be dressed in when it became a butterfly. My disinterest in their imaginary playground adventures, only caused to further distance the other kids, which is why anyone watching me that week didn’t give my sitting off to the side another thought. Even back then, I knew I couldn’t save the world, but there were smaller acts I knew in my heart could make a difference. I tuned out Ms. Valerie’s reminders on studying our vocabulary words for tomorrow’s test, and furiously scribbled the spelling words in my notebook as I stole glances at the clock. I tapped my foot, rocked my chair, and twirled my pencil, nervously anticipating the sound of the bell that would signal lunch hour. I was halfway out of my seat with my brown paper lunch sack in hand when the bell finally rang. I practically ran out the doors to the playground and took my post at the merry-go-round much like I did every day. 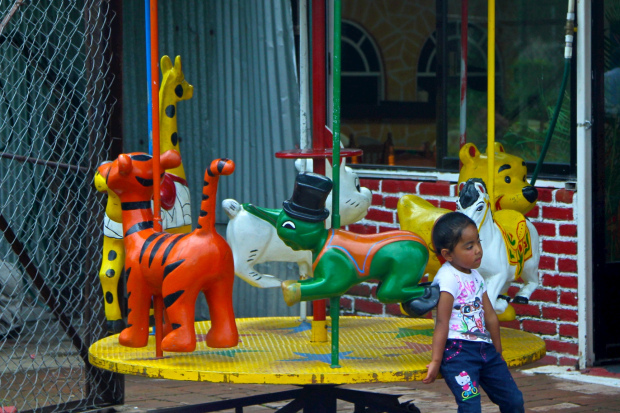 The rusty old merry-go-round had gone its last round. No longer adventurous enough for the others it was often neglected. Like me, it had been pushed out-of-the-way, off to a corner of the playground where it didn’t get noticed much. It wasn’t that I was afraid someone would want my spot, more that they would discover my secret. I waited until everyone was distracted with their lunches and slowly crouched down under the merry-go-round. As I looked at the animals circling me above, I silently thanked them for protecting our sweet friends below. I pulled out my milk carton, poured it into the old plastic container I had hidden near the fence, and presented it to the sweet kittens that had become my closest friends this past week. As much as I wished to remain with them in this little alcove of ours, I also knew that drawing attention to them wasn’t a good idea. Back then, the thought never crossed my mind that there were people out there who didn’t instinctively love animals, but I had seen how some of the kids would throw rocks at birds that were perched on the slide or take a stick to a bug just to watch it ooze. It was something I didn’t understand. I still don’t. The years have come and gone since the days when I sat watch over those kittens, many years of witnessing abused and neglected animals arrive at my clinic. Some I’ve been able to save. Others I’ve lost. In many ways I’m still that little girl who doesn’t understand that there are people in this world who don’t instinctively love animals. Worse yet, there are some who wish to hurt them. They should know, my joints may be a bit rusty and I may move a bit slower, but unlike the old merry-go-round I still have a few rounds left in me and will help and protect these innocent animals until my final round. This was my creative response to the Weekly Writing Challenge: 1,000 Words: A fictional story based on the photo, Alone in the Playground, would be great. (Who is this little girl? Where is she? What is she waiting for? Where is her family? ), but we also look forward to non-fiction posts inspired by the photo. How does the image make you feel? Does the girl remind you of anyone in your life, or of yourself? Are you as scared of the unidentifiable green creature as we are, and is that a nose or a beak? The challenge is called “1,000 Words” after the famous phrase, but don’t feel that you need to write that much (or that little) — however many words your story requires is the right number of words. Feel free to include the image in your post, with a link back here. Like your character, you really do have a “few rounds left in you.” It’s evident that you’re writing from a place of familiarity–the care and protection of animals. I can definitely relate. I even spare spiders from drowning when I’m taking a shower. Every creatures deserve a shot a life, right? Wow. What a great and creative place you went with this. I am actually confused if this is fiction or real, so convincingly did you write the story. I never cease to be shocked at animal cruelty, and the way all animals–from wild, to domesticated, to “livestock”–are continually maltreated by global society to very little outcry. It’s their world as much as ours. Together, people that care can & must seek to change their current circumstance. Good energy pieces like this are fundamental, and help fuel right action. Oh goodness, I’ve always loved animals, and seeing them hurt or killed affects me more than seeing people in pain. Katie, I’m the same way and have a hard time understanding why anyone would hurt an animal.